MANILA, Philippines - The National Police Commission (NAPOLCOM) officially announced on Tuesday, June 20, the partial results of promotional examinations conducted on April 23, 2017 in designated schools in Metro Manila and other testing centers nationwide. NAPOLCOM Vice-Chairman and Executive Officer Atty. 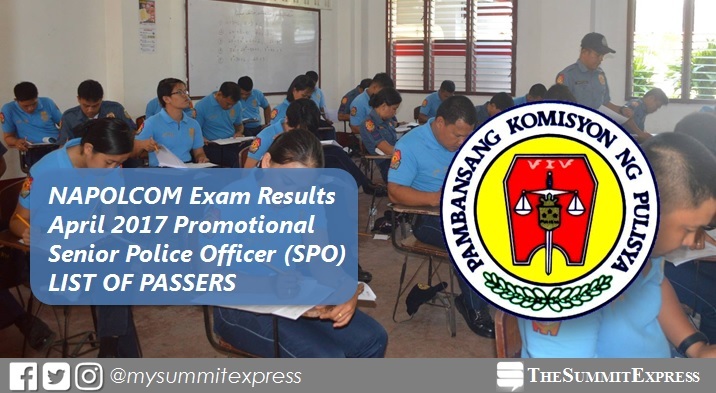 Rogelio T. Casurao announced the full list of passers for Senior Police Officer (PO) exam. A total of 2,648 out of 7,819 (33.87%) passed the tests. 17-04-1301590, GANGA, JUSTIN JOSHUA . Aside from PO exam, the commission also released results for Police Officer (PO) and Philippine National Police (PNP) Entrance Exam categories. The results of the Police Inspector and Police Superintendent exam categories shall be released soon.